I have always loved diners, especially in small towns. That's where everyone gets their news. I saw news coverage about some restaurants doing away with tips, and could see there were strong opinions on both sides. Put strong opinions and workers' livelihood together, and there's room for murder. Populating the town with quirky characters wasn't too hard — I wanted a mix of funny and serious, old and young. Developing Police Chief Elizabeth Friedman was harder, because I wanted a talented person but not a hard-ball, constantly swearing cop. 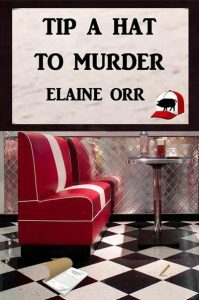 She needed to be a dogged investigator but still empathetic with business owners and the local frat members who tended to cause trouble. Medical Examiner Skelly was fun to write, and he'll be in future books. Right now he's interested in Elizabeth and she thinks of him as a good friend. That could change. only did wait staff see no point in smiling when their backs or bunions hurt, the talk around town was that it could have been what got Ben killed.